Jim & Allan Ferrie have been honoured by the Scottish Equestrian Association in recognition of their contribution to the Equine Industry. 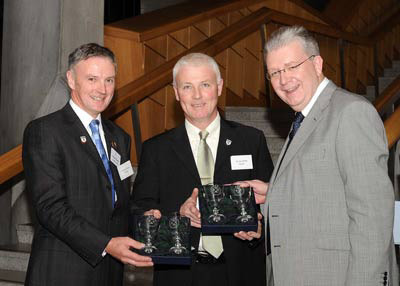 They were delighted to accept their award at the Scottish Parliament Buildings at a reception in November 2008. Pictured above with their awards and the Scottish Minister for the Environment, Michael Russell. Congratulations to them both! Lantra presented a top award to the Approved Training Farrier (ATF) of the Year 2007 at the Worshipful Company of Farriers Diploma Presentation Ceremony in London on Thursday 28 February. The ATF of the Year 2007 was handed to John William Hughes, RSS Hons. Industry Partnership Manager, Lisa Jarvis, presented the prize of £500 on behalf of Lantra to Mr Hughes, who also received an engraved glass Award from the FTA and a morbid specimen training tool from farriery supplier, Stromsholm. Mr Hughes, who runs a family-based farriery business in Malpas, Cheshire, said: “I am thrilled and delighted to have been announced as the ATF of the Year. This Award is a great idea and hopefully will encourage excellence throughout the industry. When choosing the winner, a panel of judges, independent from the FTA, looked for a variety of qualities including how the ATF prepared his apprentice for the ‘real world’ of farriery; the professional and business skills and values he passed on; how he helped his apprentice overcome difficulties and whether he inspired his apprentice to consider becoming an ATF in the future. Mr Hughes was described by the Judges as ‘teaching his Apprentice to the highest standard’, and ‘passing great skills and confidence onto his Apprentice’. The college, the previous Apprentice and the Field Officer praised Mr Hughes for being a ‘supportive and positive ATF who strived to get the best out of his Apprentices’ and mentioned that ‘encouragement was never in short supply’.